At Union Ridge Elementary School, students are learning how to resolve conflicts with one another using a tool called the Peace Path. For the school’s counselors, the end goal is for students to become more independent in problem-solving, and Peace Paths are enabling students to do so. During social emotional learning time, students are learning that conflict is a part of everyday life that can be addressed respectfully and resolved effectively using the Peace Path. To use the Peace Path, they are taught how to use “I” statements and learn how to listen, cooperate, compromise and create plans together to resolve conflicts. The Peace Path is a physical activity. It encourages both verbal and non-verbal communication skills. 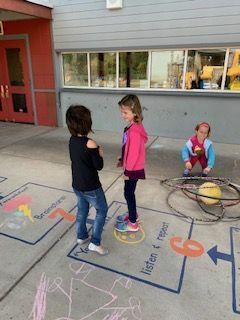 Students who disagree stand face-to-face at the start of the path and move step-by-step along the guided path using the skills they learned in class until they reach a resolution. Cool Off - Take time to cool off. Talk - Share how you felt. Listen - Learn how the other person felt. No interrupting. Brainstorm - Think of ways to solve the problem. Agree - Choose an idea you both like best! Treat each other with respect. Not only does the Peace Path empower children with self-regulation and life-long communication skills, it also creates calmer and more productive classrooms, and can help resolve conflicts at home. 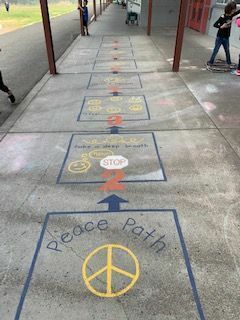 Michelle Lindbo, paraeducator at Union Ridge Elementary, designed and painted the school’s two Peace Paths last summer using ideas from the school counselors. Each path is now available for students to use at each of the school’s playgrounds.